SUP (Stand Up Paddleboarding) has significantly gained popularity over time. Water sport enthusiasts from around the world use it whenever waves are not adequate for surfing. You can even do it on a lake, a river, or any body of water. Here are the following reasons you should cross paddleboarding off your bucket list. 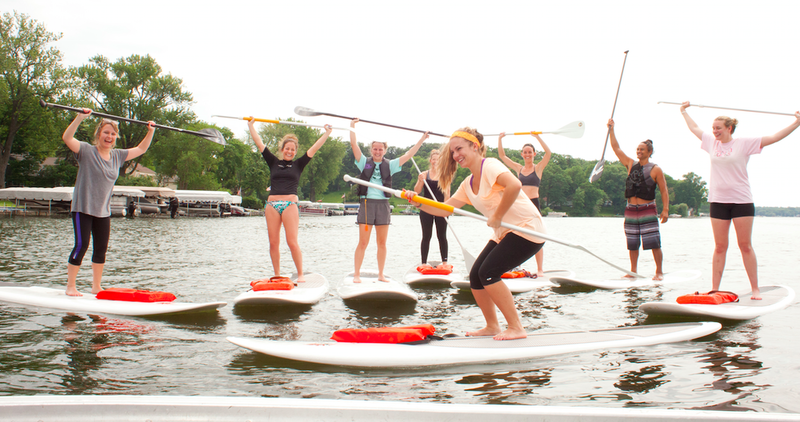 You can do it with us on the famous Pewaukee Lake, WI if you'd like! Paddleboarding may be an extremely intensive type of exercise. Paddlers must master strength and equilibrium in order to keep good position and move their boards forwards. Depending on your own place, your work speed could change from simple to demanding. Whereas, gliding over steady water like in safe reefs is more relaxed. While SUP provides full body workout, its effects are greatly accentuated on your core muscles. You will end up using your legs a lot for balancing. Still, it's your core abdominal and back muscle groups that are always put to use to stabilize yourself over the board. Burning great quantities of calories while keeping your joints relatively safe is one significant edge of SUP. Injuries brought on by high impact exercises for example running and weight lifting infrequently worry paddlers. Even those athletes who are recovering from joint-associated injuries can substantially take advantage of the sport. Since paddleboarding combines strength and cardiovascular training into one fun sport, enthusiasts can readily see improved complete fitness on themselves. With this advantage, many athletes and trainers use SUP for cross-training to improve power and durability. The aerobic training SUP supplies substantially improves the cardiovascular health of its professionals. For this reason it is said that paddleboarding can significantly reduce an individual's risk from stroke and heart attack. With your weight checked, you may have better protection against obesity-associated ailments like stroke, heart attack, diabetes, depression, and joint problems. Being out in the water having fun will also enable you to fight stress. Tension is among the new largest culprits in regards to health problems. SUP will help improve your own body's immune system by alleviating stress. Stability is a major variable in many sports. yoga, Football, basketball, wrestling, and mixed martial arts are just some of the sports that reward athletes with strong sense of balance. Paddling while standing over a going board needs one to develop your core muscles and be quick enough to adjust your position promptly.